It's been freezing here in New York City lately -- yesterday morning was about 14 degrees Fahrenheit! 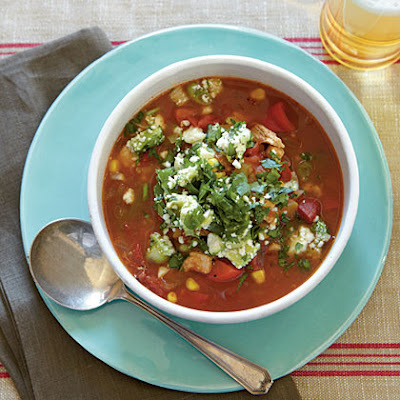 A way that I usually warm up is to either drink a hot cup of coffee or cocoa, or sip some soup :) The following recipe for a Chili-Spiced Chicken Soup which I found on Cooking Light sounds not only healthy, but easy to make! (The recipe makes 8 servings). Sounds like a spicy hot soup, hmmm...nice! keeps you warm. thank you for sharing this recipe! want to try out this recipe in few days! Now that would hit the spot today in the frigid NE. Thanks for sharing Audrey. So good, I would love some! This weather is PERFECT for chili....yum!! perfect for those cold winter nights! i seriously just made spicy chicken soup last night!!! This sounds soo yummy! I have got to try this! This sounds so good! Thanks so much for sharing!! I love soup all throughout the year!! Wow! And it's light? I think I need to definitely try this one. Looks tasty and is perfect for this weather! Thanks for sharing! hmmm, yum yum! thanks for the recipe! Perfect for warming those cold winter nights up! Yum! That sounds so, so delicious. Soup is one of my favorite things about winter. I love them all. I hate cooking haha, I rather go out to eat.. I wish you the best in this new year, dear. yummm i was just thinking yesterday how i was craving chili.. now i must try this recipe! Mmm I haven't had soup in forever, this looks delicious! This looks so yummy! Maybe I'll try to make it, too! OMG!! Love ,loveee your blog !!!! we are totally following you !!! =D would you follow us back? This sounds so comforting -- and WARM, which is vital since it's freezing outside! Ah, sounds delicious! I love soups like this. This sounds so yummy and comforting--perfect for a cold winter night! This looks so delicious! It's perfect for the winter! That looks so delicious! Yummm! Gosh that looks delicious! I think I should really try this recipe out ~ I love to cook but I'm always too lazy to do so, haah! I always love a big bowl of soup to warm me up in the winter, that with a small dinner roll and I'm in heaven. YUM! Just perfect for a chilly winter day like today! Love cooking light magazine! What a creative way to combine 2 great soups. Wow, that sounds sooo delicious! I have to try to make this sometime. that looks so delicious! and i love salads! i willmost definetely try this out! This looks SUPER delicious!! Love spicy soups in the winter! ohhh yummy! good for cold days.